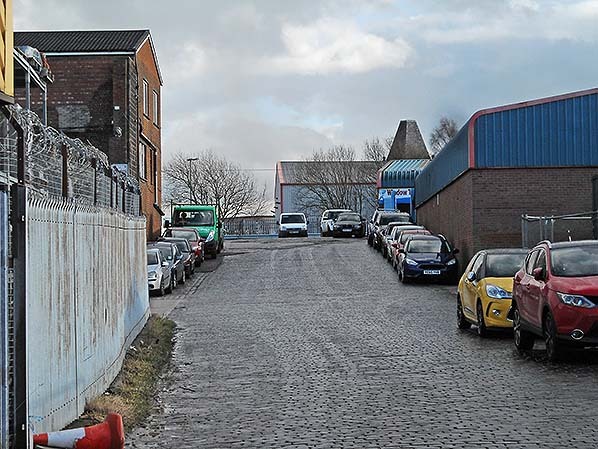 Location: At the southern end of Railway Street, a lane now within a small industrial estate; a barrier is closed across the lane outside working hours. Railway Street is immediately east of Moss Lane, which formerly passed under the railway but is now a cul-de-sac. Date closed to passengers: 28.4.1889.The present station, 26 chains south-west, replaced it. 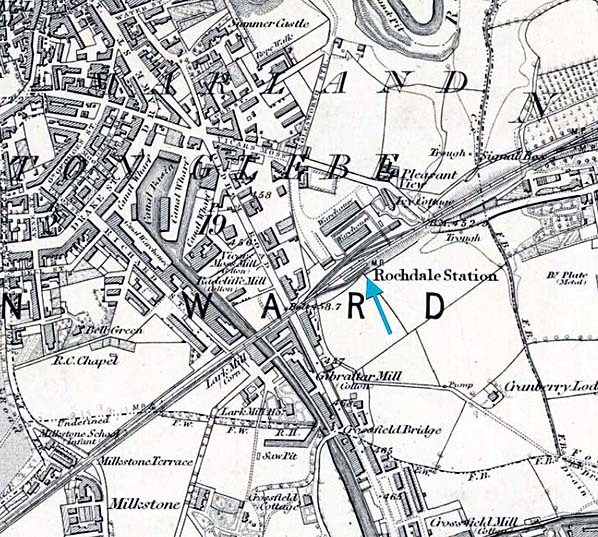 Notes: On 4 July 1839 the Manchester & Leeds Railway opened between Manchester Oldham Road and Littleborough; Rochdale was an intermediate station. At its opening Rochdale station was incomplete. The northward progress of the railway was delayed while Summit Tunnel, between Littleborough and Todmorden was under construction. The site of Rochdale station was over half a mile from the town centre, but had an earlier railway proposal of 1830 come to fruition the station would have been about 1¼ miles from the centre. The station stood north-east of Moss Lane bridge, access being via an approach road (Railway Street) to a horseshoe-shaped forecourt in front of the ‘railway office’ on the Leeds-bound (down) side of the line. The rather plain single-storey brick building had a pitched slate roof and raking parapets. On the railway side was a canopy supported by six posts. On the opposite side of the line a wooden shelter was constructed c1843. A map of 1851 and engraving of the late 1840s show that up and down platforms were provided, but that access to them from the booking office (‘Railway Office’ on an early plan) entailed a walk across sidings to reach the rail-level down platform, without any shelter, and across the two ‘main line’ tracks to reach up platform as no footbridge was installed. Piecemeal improvements were made to the passenger station in the 1860s and ‘70s. A footbridge was eventually installed in 1866. On the down side a two-road engine shed (‘Engine House’ on an early plan), north-east of the passenger stations, was built c1841, but lasted for only eight years. Between the shed and the booking office were two goods warehouses served by sidings leading from wagon turntables. A carriage shed was placed on the up side behind the passenger shelter. Two turntables on the siding into the carriage shed enabled wagons to cross the running lines, north-east of the passenger station, and reach the warehouses. 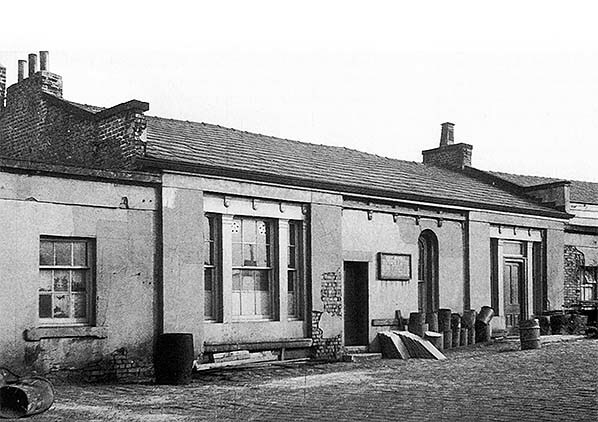 A stable for 30 horses and a horse-keeper’s house were provided behind the station, off Milnrow Road. On Christmas Day 1881 a fire destroyed the earlier warehouse. The later warehouse was not affected by the blaze, but it was to be incorporated into a new stone structure which was completed c1883 and accommodated five sidings reached by nine wagon turntables, as well as four internal wagon turntables, seven capstans, five weighing machines and 17 cranes. Between the warehouse and main running lines an engine house and pump were constructed to operate the hydraulic machinery in the new warehouse. In 1884 Milnrow Road Coal Sidings, capable of holding 270 wagons, were added on the eastern side of Milnrow Road between the running lines and Chichester Street. In the face of increasing traffic the Lancashire & Yorkshire Railway set about widening the route between Manchester and Normanton – a project that would never be completed – but the construction of a new, re-sited station at Rochdale did go ahead. This was an element of the Bill presented to Parliament in 1882 relating to the short stretch from Castleton to Rochdale. The contract for this work was awarded to George Parkinson. Trains ceased to call at the original station and were handled at the new one from 28 April 1889. The new station comprised an up platform of 367yd and a longer down platform of 400yd. Bays were set into both ends of each platform. Demolition of the original station platforms soon took place, and Rochdale’s goods station was enlarged to include their site. However the building which accommodated the booking office survived until at least the late 1950s, probably by permanent way staff. Its site now lies within a small industrial estate served by the old station approach road. Route map drawn by Alan Young. Ticket from Michael Stewart. Click here for a brief history and bibliography of the Bacup to Rochdale line. 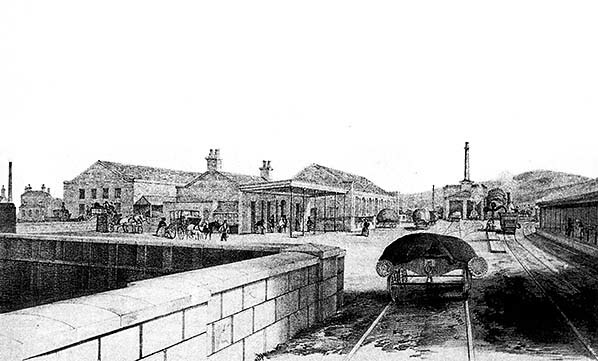 This engraving is understood to date from the late 1840s and it shows the original Rochdale station, looking north-east from Moss Lane bridge. The view is from one of the sidings giving access to the two-road engine shed (just right of centre) and the goods warehouses – the tall structures, centre and towards the left side of the picture. The two tracks of the main line enter the picture from the right edge. The passenger station building is the single-storey structure with a pitched roof and canopy, just left of centre. To reach the minimalist, rail-level platform for northbound (down) trains passengers must first walk across the sidings; an engine is seen taking water at the column just beyond the platform. The up platform, for trains to Manchester, is seen far right. It is of a more conventional height than the down platform and a canopy provides shelter to the two waiting passengers. This station underwent alterations over the following decades but closed in 1889 when the present-day Rochdale station replaced it. The details on this engraving can be compared with the large-scale OS plan of 1851. 1851 10:10,560 (6") OS map. 1851 1: 1,056 OS map. 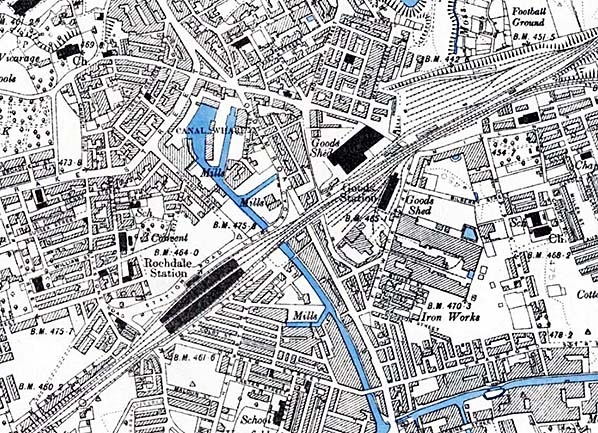 It is fortunate that the Ordnance Survey produced this excellent large-scale plan, even though the station was some way from Rochdale town centre. The ‘Railway Office’ (containing the booking hall) is set back from the double-track main line, and separated from it by sidings en route to the goods warehouses and ‘Engine House’ (loco shed). The two passenger platforms are shown, that on the up (south-east) side having a series of dots indicating posts to support the canopy, and being backed by the carriage shed. No footbridge is installed, so passengers leaving the booking office and wishing to catch trains towards Littleborough, Todmorden and points beyond have to ensure that it is safe to cross some sidings before they reach the shelterless down platform; if they are travelling to Manchester they then have to summon up the courage to walk across both main line tracks. Two goods warehouses of substantial size are named, and access to them for railway wagons is shown to be via turntables with ‘secondary’ sidings at 90⁰ to the sidings which branch from the main lines. Two secondary sidings cross the main line as they connect sidings behind the up platform with the goods warehouses. Click here to see a larger version. Apart from the station building the original station, closed in 1889, has been swiftly demolished to enable its site to be incorporated into the greatly enlarged ‘Goods Station (L&YR)’. An ambitious development of sidings and a railway workshop have been added on the up side, encompassing the site of the former up passenger platform and the carriage shed. A goods warehouse has also been added on the up side. To the north-east are Milnrow Road Coal Sidings (constructed in 1884), identified as ‘Mineral Yard’ on the map, plus a further goods shed. Click here to see a larger version. 1894 10:10,560 (6") OS map. 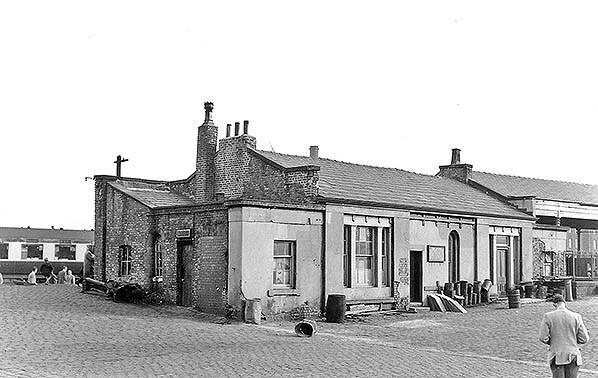 The ‘Railway Office’ of the first Rochdale station survived for many decades after its closure in 1889, and it is seen here in August 1956. The building is apparently in use by permanent way staff, judging by the stack of flagstones beside the door. Its structure is remarkably unambitious considering the rising importance of the industrial town that it served. It is a single-storey affair of no architectural distinction, brick-built with rendering which is crumbling. The view is southwards from the old forecourt approached via Railway Street. A canopy formerly extended from the far side of the building. 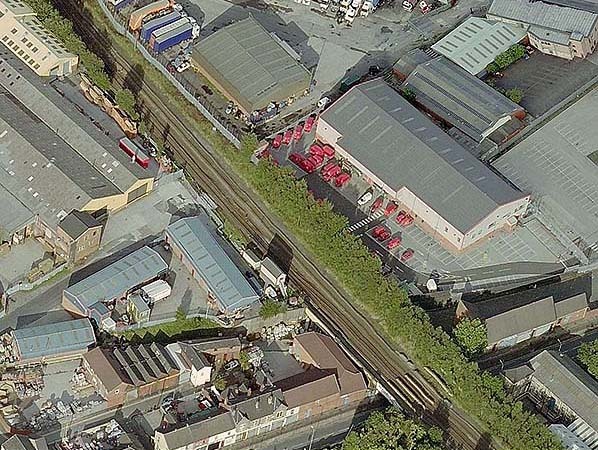 The structure, far right, is a shed within Rochdale station’s goods yard. The photograph appears to have been taken on the occasion of an enthusiasts’ visit to the station, judging by the attire of the men (far left and foreground) and the presence of a young boy at the scene. No record has been found of a railtour calling here in August 1956. The ‘railway office’ of the first Rochdale station survived for many decades after its closure in 1889, and it is seen here in August 1956. The building is apparently in use by permanent way staff, judging by the stack of flagstones beside the door. Its structure is remarkably unambitious considering the rising importance of the industrial town that it served. It is a single-storey affair of no architectural distinction, brick-built with rendering which is crumbling. The view is southwards from the old forecourt approached via Railway Street. A canopy formerly extended from the far side of the building. The structure, far right, is a shed within Rochdale station’s goods yard. 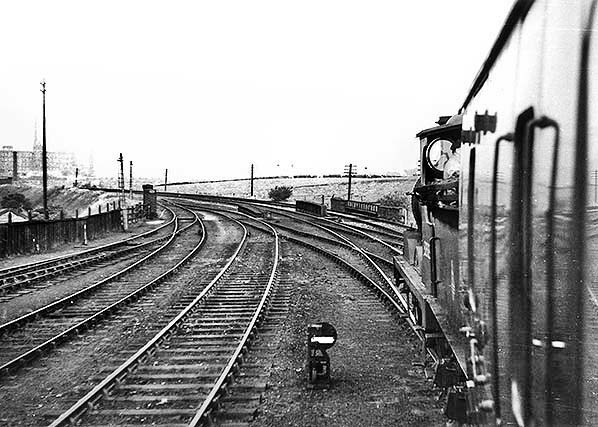 Looking north-east from the Roch Valley Railway Society’s ‘Salford Hundred Railtour’ train on 28 July 1962 between Rochdale and Wardleworth. The train has left the main line at Rochdale East Junction and is approaching the bridge over a trackway about 100yd north-east of the junction. Since 1960 the up (far right) track has been out of use. No.52523 is hauling the train in the down direction to Facit; No.40063 would head the train back to Rochdale. 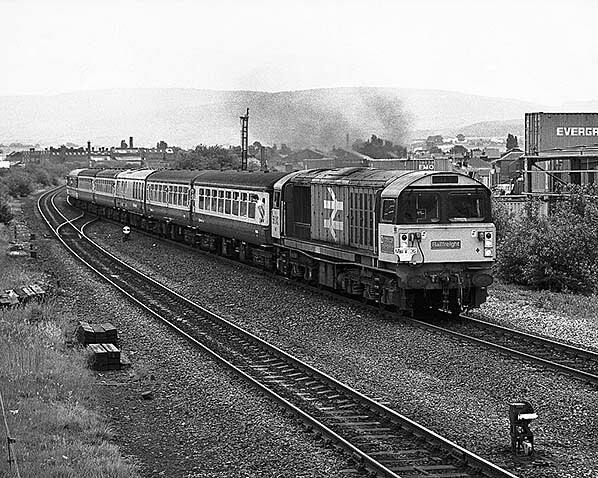 On 27 June 1987 the Pathfinder Tours’ ‘Aintree Hurdler’ is approaching the site of Rochdale 1st station from the north-east, having started its journey at Bristol and just visited the Oldham Loop. The loco is BR 58 042 ‘Ironbridge Power Station’. 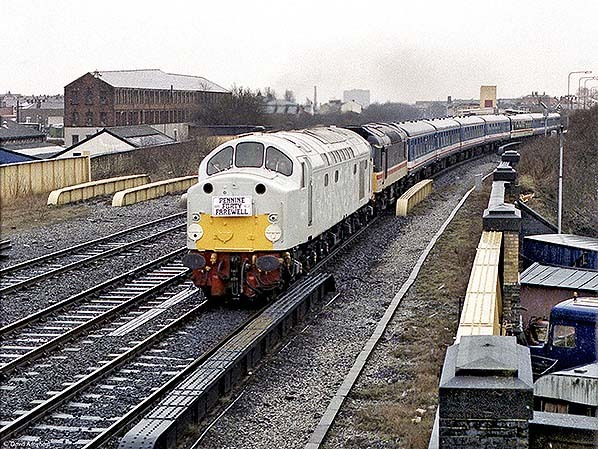 A fleet of 50 such Class 58 locos was constructed for use on MGR (‘Merry-go-Round’) trains conveying coal to power stations in the Nottinghamshire area. This loco entered service in May 1986 and was withdrawn in April 2002. Having been exported to France in August 2009 it is currently stored out of use. Looking south-west from Rochdale signal box on Saturday 12 March 1988. The site of Rochdale (1st) station is immediately behind the photographer. BR English Electric (Vulcan Foundry Ltd-built) Class 40 diesel-electric locomotive No.40122 of Crewe Diesel TMD is crossing Moss Lane bridge on the down main line, hauling BR Class 97/2 Bo-Bo electric heating unit number 97252 ‘Ethel’No.3 of Old Oak Common TMD on the Pathfinders Railtours' Taunton to Liverpool Lime Street 'The Pennine Forty Farewell' charter (1Z36). It is formed of 5354, 5386, 5494, 17058, M1644, 13488, 5444, 5360, 5264, 6609 of which it was in charge between Stockport and Crewe. From Rochdale the train should have run via Wakefield Kirkgate, Methley Junction, Whitehall Junction, Dewsbury, Huddersfield, Manchester Victoria and Earlestown to Liverpool Lime Street, but was diverted at Earlestown to run via Warrington Bank Quay to Crewe in an attempt to make up lost time. A recent aerial view of Rochdale (1st) station site. The present Rochdale station is several hundred yards along the track that disappears at the bottom of the picture over Moss Lane bridge. The road entering the view from the left between the modern industrial units is Railway Street, the original station approach road. The site of the station building is the darker tarmac area, partly in shadow. Rochdale signal box is between this site and Moss Lane bridge. Looking south along Railway Street in February 2016, the lane composed of stone setts that led to the original Rochdale station and which now gives access to a small industrial estate. The site of the station building was just before the crest of the hill. On the far side of the metal fence are the tracks of the Manchester Metrolink line between Newbold and Rochdale Railway Station and, beyond, the National Rail line between Smithy Bridge and Rochdale. 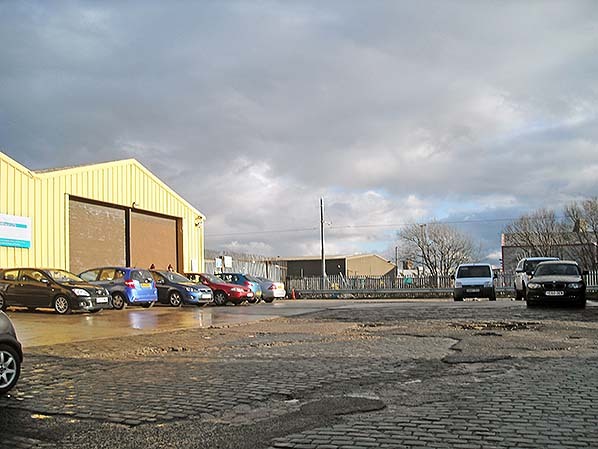 The site of the original Rochdale station at the southern end of Railway Street in February 2016, now just a stone-sett lane leading into a small industrial estate. The former station building was located ahead and to the right of the picture corresponding to the area of tarmac. To the south, on the far side of the metal fence, are the tracks of the Manchester Metrolink line between Newbold and Rochdale Railway Station tram stops and, beyond, the National Rail line between Smithy Bridge and Rochdale.